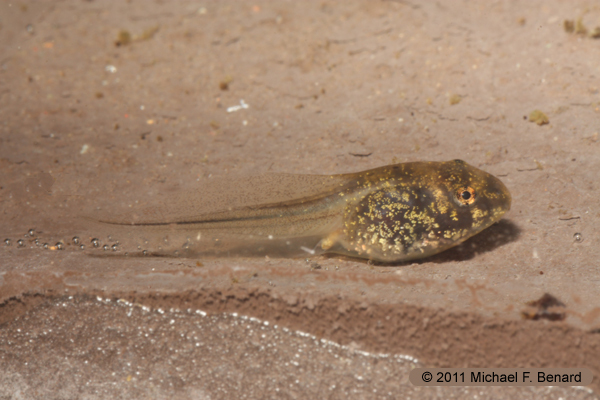 Top photo: A Bullfrog (Rana catesbeiana ) tadpole photographed in Livingston County, Michigan. Bullfrogs are native to Eastern North America, but have been introduced around the world. As eggs and tadpoles, bullfrogs are vulnerable to many different types of predators. One of the most fascinating examples I've seen are leeches that eat frog eggs! Bullfrog tadpoles sometimes co-occur with Green Frog tadpoles. Over much of their geographic range, both species typically take over a year to go from egg to metamorphosis. 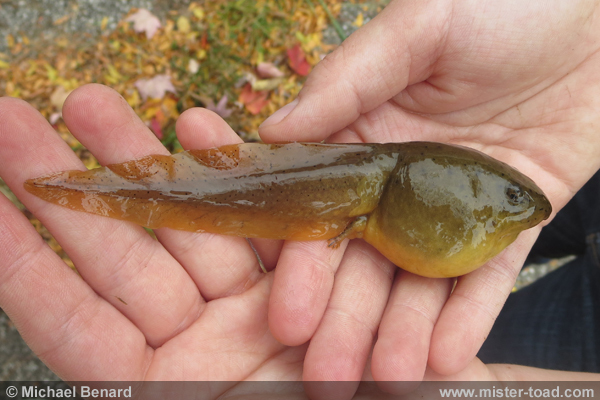 Bottom photo: A Bullfrog tadpole photographed in Cuyahoga County, Ohio.